Fall marks the beginning of the end of summer, but that doesn’t mean you can’t enjoy one last “hurrah” by gathering with family and friends to celebrate. Many people choose to grill on a fall weekend, so if you’re planning on firing up the grill, you’ll definitely want to give some of these delicious and Mexican-inspired Mexican themed party recipes a try. They’re sure to be a hit! Over medium-high heat, grill the corn (turning as needed) until it’s nice and brown all around—typically about seven to ten minutes. Then, brush the corn with the butter and grill for a few more minutes before removing the corn from the grill. 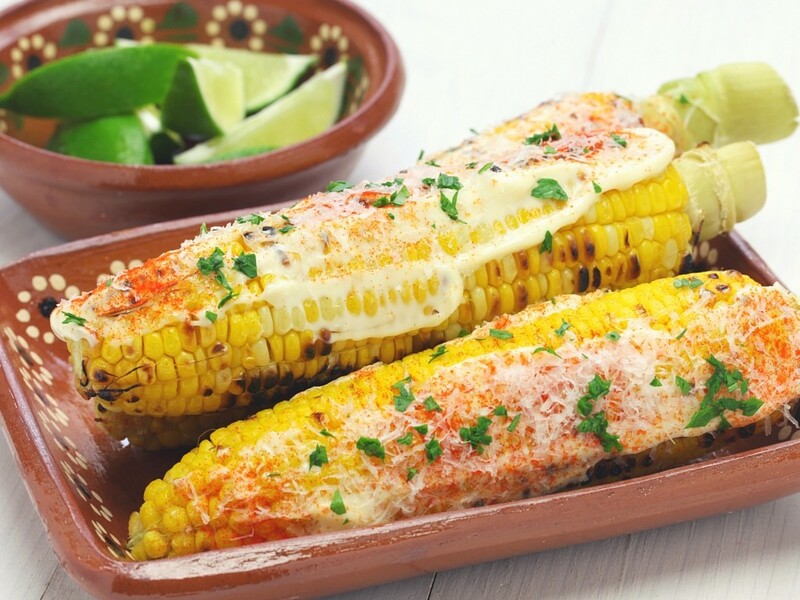 Spread the sour cream over the corn and top with the cotija cheese. Add a little bit of fresh-squeezed lime juice for an added kick, and enjoy! Start by mixing together the balsamic vinegar, olive oil, salt, and garlic in a bowl. Then, add the sliced mushrooms to the mixture and allow them to marinade for at least 30 minutes. Once ready, heat more olive oil in a pan and add the onion and peppers; cook until soft and tender. Add the mushrooms to the pan and let cook until soft and brown. Serve on corn tortillas with salsa, guacamole, and other desired toppings! Start by cooking the chorizo over medium-high heat, using a spatula while cooking to break the chorizo into small pieces. Then, set the chorizo aside to cool while you add the onions and potatoes to the pan to brown. Finally, toss the chorizo into the potato/onion mixture and cook for an additional minute. Season with salt and pepper, then enjoy! These three Mexican dishes are just a few possibilities for your next party. Be sure to give these a try and see just how quickly your guests gobble them up!